So much to see, so much to see, so I saw some of it, a jazz & blues pitta bread with slices of meaty sausages that are The Victor Pope Band in the middle. My companion for the night was Ms. Teri Welsh, who was out reviewing the latter segment of my musical butty, & also my bonnie & intellectual companion of some style. 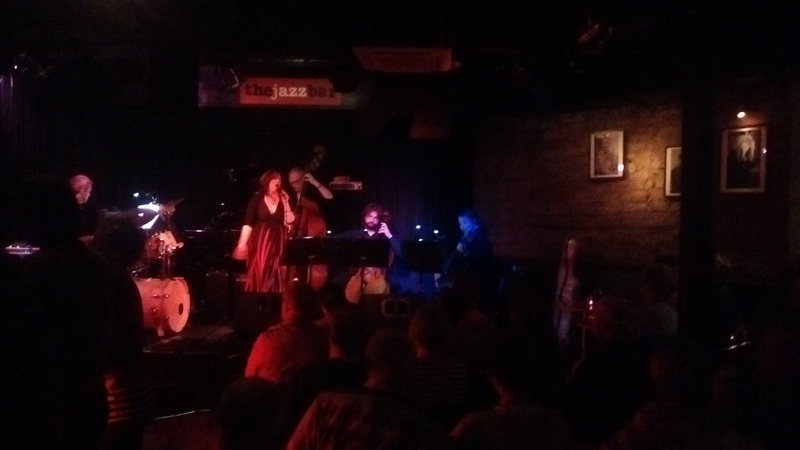 First up was the Jazz Bar the classically moody tones of Jess Abrams & her band, who in a recent interview with the Mumble declared her origins as, ‘I’m from New York City with Woodstock, Santa Fe, and occasionally a red van, in the mix (the perils of hippie parents!). Now I live in lovely Edinburgh.’ She built a great rapport with the crowd to immediate effect, holding court from her own living room it seemed, with anecdotes as long as the songs it was all too frickin cool, like, as we jazzelites revolved around the star that is her effortless timing & softly, softly decadence. I don’t know if we’re quite there yet. But if we are I like to think we’re kind of the secret shame of the family. The deformed sibling twisted by too much inbreeding who they keep locked in the cellar and occasionally throw lumps of raw meat at. But one day, through monstrous Machiavellian machinations, he will rise to power to reek his terrible revenge. Kind of like Game of Thrones or summat. The final bit of mi pitta, the part where the meat & the sauce & the salad just blend into one tasty & perfect blob of goo, was the Queens of the Blues by the Blueswater collection of musicians. Teri was loving this – she chose it especially to review – & so was I, as Nicole Smit regaled us in her pink shoes & cyan-blue daisy-dress, backed by her band of seven bootstrapping lads. ‘Alright guys, give me everything you’ve got,‘ she demanded of the band as we were taken on an excellently tunage-chosen voyage of discovery through the leading ladies of the Blues; Esther Phillips, Ruth Brown & all the other greats were assembled into what I thought was the greatest history lesson I’ve ever witnessed. Really fuc£in’ cool! All-in-all, a bangin’ butty that.